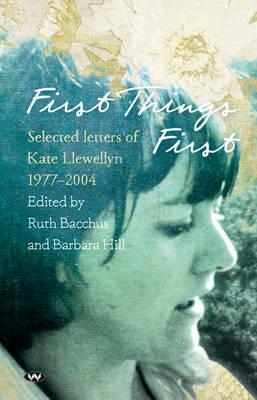 First Things First: Selected Letters By Kate Llewellyn 1977-2004 edited by Ruth Bacchus and Barbara Hill, Wakefeild Press 2015, was launched by Kerryn Goldsworthy at Burnside Public Library, Adelaide, on 7 May 2015. In 1913, Ellen Milne Bundey made provision for the award of a poetry prize in honour of her parents, the late Sir Henry and Lady Bundey. Since then, the Bundey Prize has given encouragement to many young poets, including Rex Inagmells, Max Harris and Kate Llewellyn. Now, I know for a fact that the prize has indeed given encouragement to at least one young poet, because the day that Kate won the Bundey Prize for English Verse is my earliest memory of her, exulting in the corridor of the English Department. She was, if memory serves, actually jumping up and down. This would have been in 1975, forty years ago, and two years before the date on the first letter in this collection. She had already had a full adult life so far, as a nurse, a wife, a mother, and a student, and she will correct me if I’m wrong here, but I think winning the Bundey Prize was probably the moment at which Kate seriously decided that she was going to become a writer. And more than most of the writers I know, she has lived what we all imagine as the life of a writer, ever since: financially precarious but rich in events, emotions, travel, bouts of intensely hard work, and much energetic writing of letters. As is also typical of the life of a writer, the hard work has involved all kinds of different projects, from playing with water in her garden and then writing a book about it to slogging through a difficult collaboration on a scholarly introduction to an anthology of poetry. All of these activities come to life in this book through the letters she writes about them as they’re happening. Writing personal letters to friends and beloveds is like being some sort of sports commentator; you describe your own life to the interested parties as it’s happening, including all the falls, the clever plays, the stumbles, the terrible failures, the brilliant successes, and the places where you can’t quite see which horse won or whether the batsman is out, and you’ll have to wait for the replay. The word that most often came to mind as I was reading these letters was ‘exuberant’. Even when Kate is in despair, she describes her despair with gusto — as in her accounts of the deplorable behaviour of the men in her life, or her descriptions of a dreadful experience she once had as a writer in residence, left alone by the organisers to spend days and days being hungry, lonely, uncomfortable, bewildered and cold. What comes across in these accounts is the durability of two things that Kate has in abundance: her fearlessness, and her willingness to make herself vulnerable. I’ve gardened for days … I’ve moved three maples … 6 roses, 2 rhododendrons, and planted a heap of hydrangea cuttings I struck by leaving in a bowl all winter … Position is everything I now see in the garden, like life and tennis. …The rose scratches the window all night – it’s Souvenir de Malmaison and is to the roof now – a dream and sounds though like Wuthering Heights. “Is that you Cathy?” I mutter in the night. My 4 or is it 3 bottom teeth are loose I think I daren’t see. Old age is going to be I can see, both grim and hilarious. I do not look forward to waving goodbye to my teeth one by one as they fly out the window. … It’s been too long on the road for this old tramp and these clothes I sell are too tattered and I stumble as I walk and mutter spells in an incoherent way and will shortly shock the bystanders. [Michael] Wilding wanted to know what was my class background, why I can’t think, but I said working class because I thought it might look boastful if I said middle class and I have never quite known as my mother was so ambitious. I think a lot depends on what you define as working class. My father sold his labour for a wage but I had elocution lessons and my mother had daily help in the house. That was not because we were rich, but because she couldn’t cope with four children under five. He belonged to Foyle’s book club but we didn’t have a piano. You can see how complicated it gets. I paid $5 for a copy of Refractory Girl that had three pieces of my work in it for which they cannot pay, and that is perfectly O.K, but one was a review … that was an honour to do and a week to write and think about, another was a short story and another a poem. It costs quite a lot to be a feminist if you ask me. I took a taxi home and the driver said I was the third drunk lady he had driven that night and wondered what was going on in the town and I said ‘It’s the Women’s Arts Festival, mate, and there’s about a thousand of us in the same state’. are the weather, domesticity, love, art, gardening, the names of plants, a woman’s simple daily tasks and her heart’s thoughts. The people she meets who are her friends and visitors are included but no one else. And that is it. Bucolic, pastoral, rural, domestic, modern, feminist, even hopefully at times poetic. Yes, a “mess”, but that is how I wanted it. That is how this collection of correspondence also comes across. In letters to 20 different recipients over a period of nearly three decades, what emerges is a mind that darts from place to place, a heart that’s always in the right place, and a sensibility that’s sometimes rowdy, usually optimistic, often very female, and always full of life. Reading this book has given me a lot of pleasure; I’m happy and grateful to have been asked to launch it and send it on its way. This entry was posted in First Things First: Selected Letters By Kate Llewllyn 1977-2004, Issue 14, Kate Llewllyn, Kerryn Goldsworthy, Wakefield Press and tagged Australian Literature, Australian Memoir, University of Adelaide by Mark Roberts. Bookmark the permalink. As a fellow writer, I’d love to meet Kate one day. Until then thank you for the pleasant review. She seems like a bunch of fun. Very inspiring. I long to join Australian writers in the near or distant future as well. I found my muse in Sydney.